When I was in graduate school, I mentioned within earshot of a professor that I probably know more about alternative and independent music from 1980 onwards than I know about anything else. The professor insisted that I must know more about my doctoral thesis, but I couldn’t agree – when I think about the thousands of songs I can recognize within a few bars or can sing or hum along to, to say nothing of the masses of ancillary information like band names, albums, song titles and who dated whom, the sheer number of terabytes in my head dedicated to music is staggering. But the really astonishing part is that I’m not unusual. Everyone is great at remembering music. This is the book that explains why. Written by a platinum-selling music producer who went to graduate school to study cognitive neuropsychology, This is Your Brain on Music addresses the cognitive underpinnings of the remarkable human facility with music. Daniel J. Levitin starts with a brief, lucid introduction to the fundamentals of music theory, and then goes on to discuss how we discern rhythm and harmony, how the brain processes music, and how we remember songs, ending with a discussion of the evolution of ‘the music instinct.’ Levitin shows how these processes are complex and highly distributed, involving regions of the brain ranging from the most primitive (the cerebellum) to the prefrontal cortex, the seat of higher reasoning. Throughout the book, Levitin is clear but doesn’t oversimplify, and he alerts you to the many, many open questions that remain in the field. 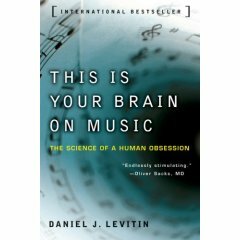 This is a great book for anyone who’s given any thought to how we think about music. 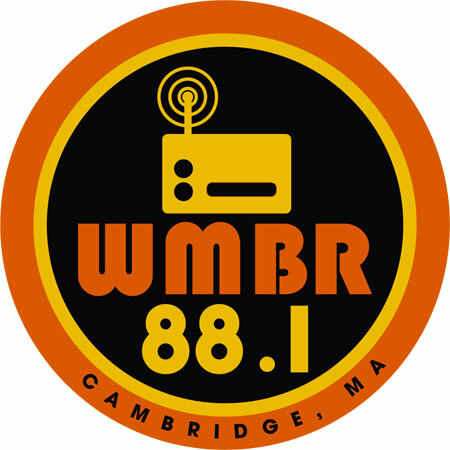 WMBR, MIT’s community radio station, has one of the coolest member premiums ever – you can come in and DJ part of your favourite radio show. I made a donation to them in their fall fundraising drive, and I’ll be heading in to the studio to be a guest DJ on their morning show, Breakfast of Champions, on Thursday, March 6th, 2008, from 8:30 to 9:30 am EST. Keith, the Thursday BoC host, was kind enough to orient me to the station and let me spend a couple of hours perusing CDs in the stacks (pant, pant) yesterday afternoon, in preparation for my on-air turn. Actually, just one, but it’s a beaut. Ted Nugent expresses his hatred of keyboards in exactly the fashion you’d expect from him. Linked to from this article about Hot Chip‘s favourite synthesizers (one of which, the Casio VL-Tone, features prominently in the Nuge’s film). Dan Deacon brought his Ultimate Reality Tour to MassArt on Thursday night, for a pretty low-key show, as this signage on a nearby bus shelter sugests. The video art was fun, especially for aficionados of Arnold Schwarzenegger movies (we clocked all three Terminators, Predator, Total Recall, Junior, and Kindergarten Cop). 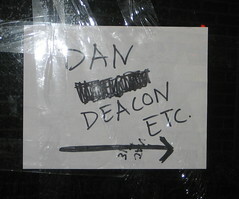 Unfortunately, Deacon’s headlining gig was a bit of a disappointment; the sound wasn’t amazing, and it was cut short by a Silly String-confiscating campus cop. The fun surprise of the night were openers Big Digits, whose dance-oriented electro filled the Pozen Auditorium with a pulsating mass of sweaty art-school kids. 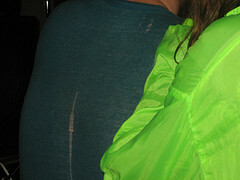 Incidentally, Dan Deacon’s favourite blue concert shirt is starting to look pretty threadbare; if anyone knows where to get another teal shirt with a psychedelic colourburst of tropical birds on the front, maybe he’d be willing to trade in the original. You are currently browsing the zed equals zee blog archives for February, 2008.